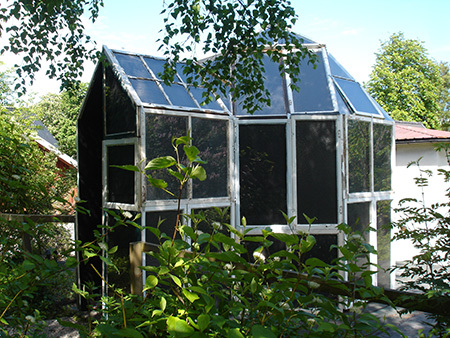 About: A glasshouse made out of old windows. The inside of the windows is covered with roofing-felt with hundreds of small holes from which light comes through. Each hole is an upside down projection of the outside surrounding. 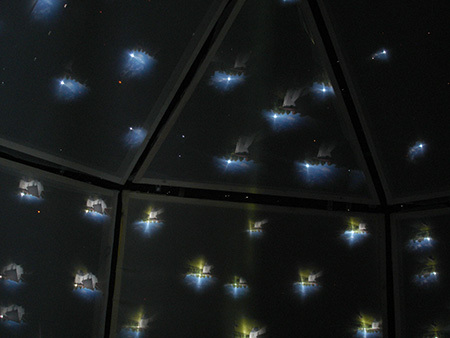 The many small projections are caught by thin fine-meshed textile stretched on frames along the inside walls; a facet eyed camera obscura or like hundreds of “real-time-videos”. Outside, the darkened windows gives a clear reflection of the surrounding, but the different angels of each window distort the image.